Hi! Long time no see. And you might have noticed that my previous post is gone, I have accidentally deleted it, what a cliché! Anyway, I just got back from my last exam of this semester, relief! And this kind of school girl outfit was appropriate to post! I love my new firmoo glasses, the shape of frame really is flattering, so I've been wearing glasses more often lately. In addition to new stuff, I also got this personalized iPad case, I created the design by myself and I think it looks really cute and girly, what do you think? so so cuuute :) Love the skirt ! xxoxo Júlia. so cute, awesome photos. Thanks a lot for visiting my blog and for the sweet thoughts. Stay in touch. very cute look and I agree those glasses really do suit you! The same happenned to me. I've been wearing glasses forever but I hated wearing them. But the glasses I bought recently i've fallen in love with them so wearing them all the time.! You look gorgeous. And that ipad case is so unique! Stunning as always dear.x Lucky you, finally some time to relax! Love your outfit, girly and stylish. Those glasses suit you perfectly, love the shape and print! 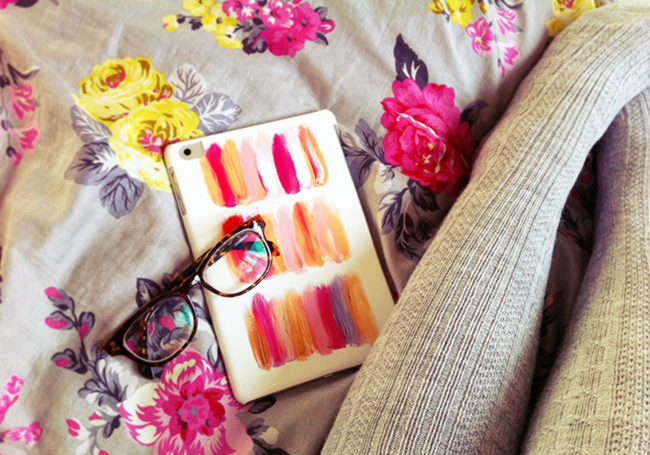 That ipad case is gorgeous.x Have a lovely day!